In this paper, the author shares three societal trends that validate and vindicate decades of leadership by constructionist educators. The growing acceptance of learning-by-making represented by the maker movement, a newfound advocacy for children learning computer programming, and even the global education crisis, real or imagined, are evidence of predictions and efforts made by constructionists being realized. The paper also asserts that the survival of progressive education and the maker movement are mutually dependent. This conference offers a brief opportunity for celebration before returning to the “hard fun” required to harness the momentum of these trends and improve the learning ecology. Three societal trends afford members of the constructionism community with cause for optimism. While two of these trends are positive and one negative, their trajectory is towards a greater acceptance of constructionist learning by formal and informal communities of practice. Recognition of the symbiotic relationship between progressive education, its learning theory constructionism, and the long-term survival of what has come to be known as “the maker movement” is critical for the long-term survival of each. Progressive education and the maker movement are at a crossroads when both rely on the other for relevance and acceptance. At Constructionism 2012, there were concerns expressed about the maker movement that to be candid, smacked of elitism. While it may be true that the moms, dads, and teachers advocating for making may lack a scholarly vocabulary for expressing principles of constructionist learning, they are not hostile to that information. The popularity of Maker Faire, Hour of Code, Scratch, and books like, “Invent To Learn – Making, Tinkering, and Engineering in the Classroom,” are proof of a desire to learn more about learning. It is also the case that academics in the constructionism community would benefit from learning what members of the maker movement know and can do. The elements of community organization and creative spirit of the maker movement are to be admired. Papert not only provided the basis for constructionism as a learning theory, but also played a pivotal role in predicting, inventing, and advocating for the constructive technology now being popularized by the maker movement. Long before his involvement in the development of programmable LEGO robotics kits or being an advocate for one-to-one computing, made the case for such innovations and even expressed the importance of hardware extensibility. In 1970, Papert and Solomon described the sophisticated technological needs of young children engaged in making things with computers. “The school computer should have a large number of output ports to allow the computer to switch lights on and off, start tape recorders, actuate slide projectors and start and stop all manner of little machines. There should also be input ports to allow signals to be sent to the computer. Neil Gershenfeld, one of the leaders of the personal fabrication movement who predicted much of the current maker movement, recounts how Papert viewed the inability of children to construct their own computers as a “thorn in our flesh.” (Gershenfeld, 2005) The availability of the $35 Raspberry Pi and its offspring the Beaglebone, Yun, Gallileo, and other low-cost Linux computers, all with an ability to interface with the world, removes that thorn. Each of these tiny computers are capable of running Scratch, Snap!, Python, and Turtle Art. They also feature a range of inputs and outputs for extensibility. Scavenging for peripherals to use with such a computer, customizing it, and programming it to solve personally important problems is consistent with both maker and constructionist ideals. The computer hardware industry and leaders in the educational computing world have spent decades deriding Papert’s claims that children should build, program, maintain, and repair their own computers, not merely to reduce costs, but as an expression of agency over an increasingly complex, technologically sophisticated world. Emerging technology, like the Raspberry Pi, is resonant with the maker ethos of “If you can’t open it, you don’t own it,” (Jalopy, Torrone, & Hill, 2005) and ideals expressed by Seymour Papert long ago. Papert’s colleagues or former students created many of the favorite technologies of the maker movement, including Scratch, Makey Makey, the Lilypad, and LEGO robotics. The FabLab and FabLab@School efforts to spread learning through digital fabrication also acknowledge Papert’s inspiration. Modern making is a brew of new technologies, computation, and timeless craft traditions. The artificial boundaries between disciplines blur and enrich each other. Attend a Maker Faire and you will marvel at the ingenuity, creativity, passion for learning, and desire to share knowledge on display. Maker Faire provides a venue for collaboration, showing-off, and sharing personal inventions. The creation of shareable artifacts is a basic tenet of constructionism. (Ackermann, 2001) Maker Faires, Make Magazine, and web sites like instructables.com provide unprecedented venues for sharing technological project ideas and products. Look in any direction at a Maker Faire and you will discover children and adults learning and creating together “samba school style.” (Papert, 1980) Kids like Super-Awesome Sylvia, Joey Hudy, Quin Etnyre, Caine Monroy, and Schuyler St. Leger embody Papert’s belief in “kid power.” (Generation_WHY, 1998; Papert, 1998) These, and other children, are beloved heroes, legends, and leaders of the maker movement, not because they are cute, but due to their demonstrable talent, knowledge, and expertise. Like in a samba school, these young experts value their interaction with elders because they share a common goal of continuous growth. Those explosive numbers only tell part of the story of the explosive growth in making and its influence on winning hearts and minds for constructionism. Maker Faires and Mini Maker Faires are official events sanctioned by Maker Media resulting from a formal application process. Countless other events led by local hackerspaces, clubs, scout troops, plus school-based maker days and Invent to Learn workshops are doing an impressive job of laying the groundwork for a rise in the appeal of constructionism. Parents in highly competitive independent schools are becoming champions of constructionism based on the benefits of making they witnessed in their own children. Such parental enthusiasm gives lie to the notion that parents want joyless schools focusing on increasing test scores and provide much needed support for educators sympathetic to constructionism, but beaten down by the status quo. After parents at The American School of Bombay participated in a half-day “Invent To Learn” workshop with their children, they began demanding that classroom practice change to incorporate more making. The maker movement and its accompanying “constructible” technology has resuscitated constructionism in a New York City public school started by Carol Sperry and Seymour Papert in the early 1980s. (Papert & Franz, 1987) Without Tracy Rudzitis’ impromptu lunchtime “Maker Space,” where the folding tables and freedom transform the learning experience for middle school students, computing would be dead at “The Computer School.” (G. Stager, 2014) In countless settings, the “neat phenomena” associated with popular maker technologies, such as 3D printing, Arduino, Makey Makey, squishy circuits, wearable computing, and conductive paint have caused schools to revive school art and music programs, otherwise sacrificed on the altar of budget cuts, tougher standards, or global competitiveness. The publication of the Next Generation Science Standards, authored by the National Academy of Sciences, (Quinn, Schweingruber, & Keller, 2012) includes specific demands for computer science, engineering, tinkering, and hands-on scientific inquiry to be part of the diet of every American. These standards, written by actual scientists, add gravitas to what some might deride as the playful act of making. If you view programming as an intellectually rewarding activity, then it is surely good news that countless millions of dollars are being spent on initiatives like Code.org, Code Academy, and the creation of computer science instruction via Khan Academy. That’s where the future jobs are, in the mix of computing with other disciplines. The second reason is that a liberal education is about understanding one’s world, and computing is a huge part of today’s world. We ask students to take laboratory sciences (like biology, chemistry, and physics) in order to better understand their world and to learn the scientific method for learning more about their world. The virtual world is an enormous part of the daily lives of today’s professionals. Understanding computing is at least as important to today’s students as understanding photosynthesis. If you understand something well, you should be able to define its process well enough for a machine to execute it. If you can’t, or the execution doesn’t match the observed behavior, we have a new kind of feedback on our theories. The pedagogical approach preferred by the coding proponents appears to be, “kids will go on the Web and figure it out.” In that case, the same paltry percentage of kids is likely to develop programming fluency now than before great wealth and media attention was dedicated to the cause. Although well intentioned and surely better than another generation of children doing little more with a computer than preparing an occasional PowerPoint presentation on a topic they don’t care about for an audience they will never meet, the advocates of coding seem wholly ignorant that many teachers used to teach children to program during the 1980s. Many of these educators taught Logo and the Logo community developed a great deal of wisdom regarding how, what, why, and when to teach children to program. Dozens of books were written and hundreds of thousands of copies were sold. We danced recursion and acted out procedureality. Now, that knowledge base is largely ignored in favor of catchy slogans and YouTube videos. The constructionism community has a wealth of knowledge to share with coding proponents and a great number of questions as well. Which programming languages are best for children to use and why? Is computational thinking a fancy term for what Alan Kay calls “computer appreciation?” (Kay, 1996) Is this just a way of providing the illusion of computing without sufficient access or actual experience? What are the goals of learning to program? How does computer programming support, enhance or build upon other intellectual processes? What can kids make with a computer? Are computing, coding, and computer science synonymous? What should a child at a particular age be capable of programming and which concepts should they be able to put into use? What sort of teacher preparation is required in order to realize the dream of computer science for all? We have no idea what children would be capable of if they programmed computers for a sustained period of time. Although we taught tens of thousands of Australian fifth-seventh graders to program in LogoWriter or MicroWorlds between 1989 and 1995, (Johnstone, 2003) schools substituted computing for report writing, note taking, and office tasks by the time those children reached high school. In many cases, computers once an integral learning appendage, were barely used at all as soon as schooling got “serious” and focused on achievement or careers. In the current coding for all craze, there is little attention given to the proposition that while programming, students may learn other things or explore powerful ideas concurrently. Programming appears to be a means to an end – becoming a programmer, even if that objective is barely defined or the process is trivial. Coding advocates also send schizophrenic messages. Somehow, the same people can assert that programming is sufficiently difficult that anyone who manages to learn to code will find herself on economic Easy Street and yet, coding is so simple anyone can do it. If we stipulate that the motives of the coding advocates are pure, new questions arise when coding is proposed as the purview of schools. Although efforts like code.org would love to infiltrate schools, they are less concerned by where kids learn to code. When a role for coding in school is delineated through governmental policy or curricular statements, the concerns become more even more acute for constructionists. Conservative UK Education Secretary Michael Gove announced in January 2012 that the national ICT curriculum should be scrapped at once because it is “a mess,” “harmful,” and “dull.” (Burns, 2012) Since Gove’s provocative BETT speech several American states, Singapore, and Estonia (Gardiner, 2014) have joined the chorus calling for all students to be taught computer science, even if they have no idea what that means or what is involved in achieving success. The exhaustive Royal Society study commissioned by the UK Government to guide the curricular shift towards every child learning computer science includes thoughts such as, “Computer Science education does not necessarily involve computers.” (Furber, 2012) Progress indeed. The UK National Curriculum is short on actual examples of what a student might do or make with a computer, but long on vocabulary leaving implementation of the curriculum prone to memorization, not actual computer science. (Berry, 2013; Department of Education, 2013a, 2013b) Regardless of your feelings about the substance of the new UK curriculum, efforts around the world are being met with opposition by the theoretically most “tech savvy” teachers in the system, the existing ICT or computer literacy teachers who are resistant to change. The road ahead seems bleak when you factor in a shortage of qualified teachers, an overstuffed school day, inadequate computer resources and an abysmal participation rate among girls and minorities. (Ericson & Guzdial, 2014; Guzdial, 2006; Guzdial & Reed, 2014) And that doesn’t even include a discussion of why so few students are interested in learning computer science even where it is offered. In the United States, there are proposals in several states to allow Computer Science to earn Foreign Language course credit. (Edutopia, 2013; Guzdial, 2014) Once again, policy-makers with little understanding of CS hear “language” and think they can check off two boxes at once, foreign language and computer science. Aside from the obvious flaws in this logic, the substitution is as much a symptom of unquestioned curricular heuristics than it is support for high quality computer science offerings. Swapping a subject you have trouble defending for CS is another example of the idea aversion (Papert, 2000b) Papert spoke of. “Computer science for all” is a laudable objective and a welcome change in direction. The constructionist and maker communities possess a great deal of expertise and wisdom that should play a major role in shaping both policy and pedagogical practice. Without such involvement, this rhetorical effort may do more harm than good. At the very moment when incredible new technologies emerge with the potential to supercharge learning, increase ways of knowing, amplify human expression, forge strange alliances, and empower each teacher and student, the School system has never been more draconian. This too is part of Papert’s prophetic wisdom. In his Perestroika analogy, Papert predicts that constructionism will be met with more instructionism, hopefully until constructionism prevails. One look at the state-of-the-art in educational computing points to a rise in instructionism. Not only do schools still have computer labs three decades after their creation, but the computers in those labs are increasingly used for computer-assisted instruction, test-prep, standardized testing, and surveillance. Cory Booker, Mayor of Newark, New Jersey said, “Computer programming is quickly becoming an essential career skill. Learning to code is a fantastic opportunity equalizer – if you’re good at it, it can help you achieve your dreams.” He did this while presiding over a scorched-earth “school reform” regime that eliminated Logo programming, art and music in dozens of elementary schools. The sudden epidemic of bad teachers proclaimed by politicians and the public’s growing dissatisfaction with schooling may be signs of the traditional system crumbling. Can we rise above this period of darkness by lighting a path towards megachange? SYMBIOSIS OR MUTUALLY ASSURED DESTRUCTION? In a toxic era of high-stakes testing, curriculum narrowing, teacher shaming and public school privatizing, the maker movement represents a ray of optimism in an otherwise bleak environment. Simultaneously, the maker movement is poised to go mainstream only if its leaders recognize the benefits of situating “making” in the context of progressive education. An understanding of constructionism and the embattled history of progressive education are necessary for the maker movement to mature. Quite simply, progressive education requires the energy, passion, new materials, and technology of the maker movement to increase its visibility, relevance, value, and urgency with policy makers, parents, and educational practitioners. For making to mature into a mature movement supporting more than a boutique industry of occasional “faires,” camps, and parties, the members of its community need to understand more about constructionism as well the historic struggle associated with the implementation of progressive education. The maker movement needs to situate their terrific passion, tools, talents, and intuition in a larger context of learning in a politically charged educational system. Both communities have a great deal to learn from one another and should recognize that they stand on the shoulders of giants. Such open-mindedness and knowledge are the minimum conditions under which each community can endure. In order to transcend minority status, a symbiosis of each community’s powerful ideas is required for the aspirations of each to be embraced and sustained by the larger society. One dilemma for the maker movement is that its major players want it to be both a cause and a profit-center. At FabLearn 2013, Leah Buechley courageously challenged Make™ to take issues of representation, inclusion, gender, race, cost, and accessibility seriously. (Buechley, 2013) Her most easily addressable criticism of Maker Media, owner of Make Magazine™ and Maker Faire™ was the lack of women and people of color on its magazine covers. That concern has been ignored to date. Buechley also pointed out the high cost of entry into “making.” Except for more expensive technology, such as 3D printers, prices do not seem to be falling quickly enough to bring “making” to underserved or poor populations, young or old. Buechley rightly described how making and Make™ have been conflated in the mind of the population while Maker Media attempts to create an illusion of public service by placing their educational initiatives in a MakerEd non-profit. However, when the White House wishes to celebrate learning by making and its role in an innovative economy, they hosted a Maker Faire™ not a maker fair. It should come as no surprise that there is a tension between commerce and changing the world. Maker Media is the 1,000 pound for-profit gorilla that creates a venue for makers to share their ingenuity in a commercial environment where others pay to interact with makers. There is nothing wrong with that. It has fueled the explosive rise in making. However, when one company controls the venue, narrative, access to market, and publishes products that compete directly with the creations of other makers, claims of a social mission need to be taken with a grain of salt. Monopolistic tendencies are incompatible with the democratic ideals of both making and progressive education. Alas, the futures of the maker movement and progressive education are at a crossroads. While the maker movement currently benefits from media attention and the public’s fascination with cool new tech toys, progressive education has been a political punching bag for generations. It is blamed for educational failures disproportionate to its influence. Without great care, the maker movement may find itself susceptible to similar mocking, derision, or marginalization. Sure, that’s nice as a summer camp arts of crafts project, but what does it have to do with raising test scores. Political and social alliances need to be strengthened between each community or the fate of both will be uncertain at best. Papert reminds us that we need to shift our self-concept in order to bring about the change children deserve. It is inadequate to dismiss schools as relics of the past because that is where you will find millions of kids who need us. Fellow travelers in the maker movement and the unlikely allies behind the coding campaign might be just the army we need inside of a cardboard horse, with LED eyes, and synthesized speech all controlled by a tiny microcontroller running Scratch. Let us spend our days at Stanford celebrating a growing acceptance of our ideas, but then return home to lead and engage in the hard work of improving the learning ecology. Ackermann, E. (2001). Piaget’s Constructivism, Papert’s Constructionism: What’s the Difference? Paper presented at the 2001 Summer Institute, Mexico City. Ayers, R. (2010). What ‘Superman’ got wrong, point by point. Washington Post, 27. Berry, M. (2013). Computing in the National Curriculum – A guide for primary teachers. London: Computing At School. Buechley, L. (2013, October 28, 2013). FabLearn@School 2013 Conference Closing Keynote. Paper presented at the Leah Buechley, Stanford University. Crotty, J. M. (2014, March 31, 2014). Is Christie-Backed One Newark Reform Plan Good for City’s Studentsq. Forbes. Department of Education. (2013a). Computing Programmes of Study: Key Stages 1 and 2 UK National Curriculum. London. Department of Education. (2013b). Computing Programmes of Study: Key Stages 3 and 4 UK National Curriculum. London. Ericson, B., & Guzdial, M. (2014). Measuring demographics and performance in computer science education at a nationwide scale using AP CS data. Paper presented at the Proceedings of the 45th ACM technical symposium on Computer science education, Atlanta, Georgia, USA. Furber, S. (2012). Shut down or restart? The way forward for computing in UK schools. The Royal Society, London. Gershenfeld, N. (2005). Fab: the coming revolution on your desktop–from personal computers to personal fabrication. Arizona: Basic Books. Greelish, D. (2013, April 2, 2013). An Interview with Computing Pioneer Alan Kay. Time. Guggenheim, D., Kimball, B., Chilcott, L., Strickland, B., Rhee, M., Weingarten, R., . . . Cassidy, J. (2011). Waiting for” Superman”: Paramount Home Entertainment. Guzdial, M. (2006). Computing for Everyone: Improving Global Competitiveness and Understanding of the World. Retrieved September, 10, 2007. Johnstone, B. (2003). Never Mind the Laptops: Kids, Computers, and the Transformation of Learning. Seattle: iUniverse. Karp, S. (2010). Superhero school reform heading your way: Now playing in Newark, NJ. Rethinking Schools, 25(3), 12-17. Kay, A. (1996). Revealing the Elephant: The Use and Misuse of Computers in Education. Educom Review, 31(4), 22. Martinez, S.-L., & Stager, G. (2013). Invent to learn: making, tinkering, and engineering in the classroom: Constructing Modern Knowledge Press. Miner, B. (2011). The Ultimate $uperpower: Supersized Dollars Drive” Waiting for” Superman”” Agenda. Rethinking Schools, 25(2), 18-22. Papert, S. (1984). Computer as Mudpie. In D. Peterson (Ed. ), Intelligent Schoolhouse: Readings on Computers and Learning. Reston, VA: Reston Publishing Company. Papert, s. (1991). Perestroika and Epistemological Politics. In I. Harel & S. Papert (Eds. ), Constructionism (pp. 13-28). Norwood, NJ: Ablex Publishing Corporation. Papert, S. (1998, June 2). Child Power: Keys to the New Learning of the Digital Century [lecture transcript]. Paper presented at the Eleventh Colin Cherry Memorial Lecture on Communication, Imperial College, London, UK. Papert, S. (1999). Ghost in the Machine: Seymour Papert on How Computers Fundamentally Change the Way Kids Learn. Interview of Seymour Papert by Dan Schwartz. Papert, S. (2000a). Seymour Papert’s CUE Conference Keynote Address (transcription). Palm Springs, CA: DailyPapert.com. Papert, S. (2000b). What’s the Big Idea? Toward a Pedagogical Theory of Idea Power. IBM Systems Journal, 39(3&4), 720-729. Papert, S., & Franz, G. (1987). Computer as Material: Messing About with Time. Teachers College Record, 89(3). Papert, S., & Solomon, C. (1971). Twenty things to do with a computer Artificial Intelligence Memo # 248. Cambridge, MA: Massachusetts Institute of Technology. Quinn, H., Schweingruber, H., & Keller, T. (2012). A Framework for K-12 Science Education: Practices, Crosscutting Concepts, and Core Ideas: National Academies Press. Ravitch, D. (2013). Reign of Error: The Hoax of the Privatization Movement and the Danger to America’s Public Schools: Random House LLC. Ravitch, D. (2014, March 27, 2014). New York Schools: The Roar of the Charters. New York Review of Books. Severns, M. (2013, Mar. 28, 2013 2:23 ). Whatever Happened to the $100 Million Mark Zuckerberg Gave to Newark Schools. Mother Jones. Stager, G. (2014, Winter 2014). What’s the Maker Movement and Why Should I Care? Scholastic Administrator, 43-45. Stager, G. S. (2006). An Investigation of Constructionism in the Maine Youth Center. (Ph.D.), The University of Melbourne, Melbourne. Dr. Buechley shared stunning statistics on the lack of diversity represented on the cover of Make Magazine (the flagship of the enterprise), the lack of editorial diversity in Make, and the cost of the most popular kits sold by MakerShed, the retail arm of Maker Media. I highly recommend that you take some time to watch Dr. Buechley’s Stanford Talk. These are not the words of a cranky critic. Leah Buechley is one of the mother’s of the maker movement (small m). She urged those with enormous capital, influence, and connections to take their mission of “Every Child a Maker” more seriously. A change in behavior needed to accompany this rhetoric in order to truly make the world a better place. Maker Media and its subsidiaries have gained access to The White House, departments of education, and policy-making discussions. With such access comes great responsibility. Every educator and parent has seen the pain inflicted on public education by corporations and other rich white men who view the public schools as their personal plaything. Earlier this week, I wrote the article, Criminalizing Show & Tell, to tell the outrageous tale of a 9th grade young man who was arrested, cuffed, detained, and suspended from school for bringing his invention to class. He hoped his creativity would gain him support in a school culture hostile to his complexion, name and religious beliefs. In my article, I addressed the steps that must be taken to correct this abuse of power, deprivation of rights, and violation of sound education principles. Since then, Ahmed Mohammed has become the cause célèbre of the Internet. Why, he got tweeted by @potus AND got his very own hashtag, #istandwithAhmed. What Ahmed has NOT received is an apology from the school district that brutalized him or the police force that wrongfully arrested him. In fact, the school district continued their victim-blaming in a letter to parents and the Irving, Texas police chief thinks that his force handled everything perfectly as well. But hey, he got a #hashtag! Case closed, right? This morning I awoke to this tone-deaf email from Makershed announcing their Stand with Ahmed clock kit sale. Worst of all, only 3 of the 12 clocks are actually on-sale. If tasteless isn’t your style, how about sweet? My social media stream is full of postings like this one. Hooray! Ahmed is getting lots of presents. Who doesn’t like presents? Who will buy all the plane tickets Ahmed and his parents need to meet the folks wishing to pose for photos with him? Will his school punish him for missing class? Ahmed was suspended for not bringing a bomb to school. The intolerant culture of his school is forcing him to change high schools. Neither social justice or the right to a high-quality public school education free of brutality and intolerance can be exchanged for exciting cash and prizes. Ahmed’s growing gift bag of goodies will do nothing to cleanse the Irving, Texas schools and community of its toxicity, xenophobia, Islamophobia, or racism. The misbehaving adults will not have their behaviors addressed. Where does a fourteen year-old boy go to get his childhood back? Veteran teacher educator, journalist, and speaker Gary S. Stager, Ph.D. is the co-author of Invent to Learn – Making, Tinkering, and Engineering in the Classroom, called “the bible of the maker movement in schools” by the San Jose Mercury News. 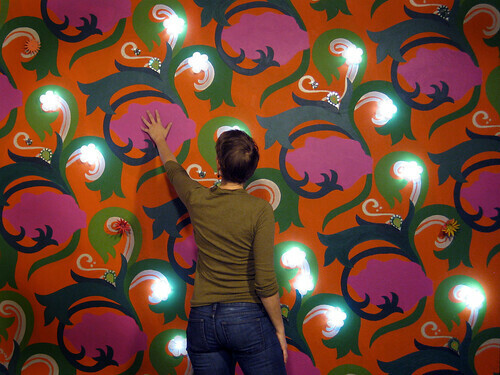 Leah Buechley & MIT Media Lab Confirmed for CMK 2012! This year’s Constructing Modern Knowledge 2012 Big Night Out in Boston will begin with a reception at the world-famous MIT Media Lab hosted by Assistant Professor Leah Buechley. Leah Buechley directs the MIT Media Lab’s High-Low Tech research group, which investigates the integration of high and low technology from cultural, material, and practical perspectives, with the goal of engaging diverse groups of people in developing their own technologies. She is a well-known expert in the field of electronic textiles (e-textiles), and her work in this area includes developing a method for creating cloth printed circuit boards (fabric PCBs) and designing the commercially available LilyPad Arduino toolkit. Her research has been featured in The New York Times, Boston Globe, Popular Science, CRAFT Magazine, Journal of Architectural Design, Denver Post, and the Taipei Times. Buechley received PhD and MS degrees in computer science from the University of Colorado at Boulder and a BA in physics from Skidmore College. Register today for Constructing Modern Knowledge 2012 and enjoy substantial early-bird savings!